Everyone PLEASE sign this petition, The Lion King live action remake would not be the same without it. 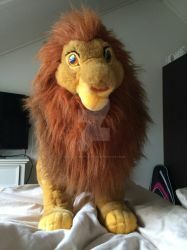 I'm a 20 year old female who is a long time collector of Lion King memorabilia since I was only 8 years old. It all began when I saw the play in New York with my parents. And since then, it's become a big hobby with me. I pretty much only collect the memoralibila released when the movie first got released in 1994. I also enjoy collecting coins, antiques, looking at classic cars, and playing the saxophone. I once had ALOT more Lion King stuff, until I moved, and lost some boxes But when I get new stuff, I post pics of it here on DeviantArt. So have a look around and tell me what you think in the comments box. Do you like the movie, Balto? Oh, never mind what I was about to ask.